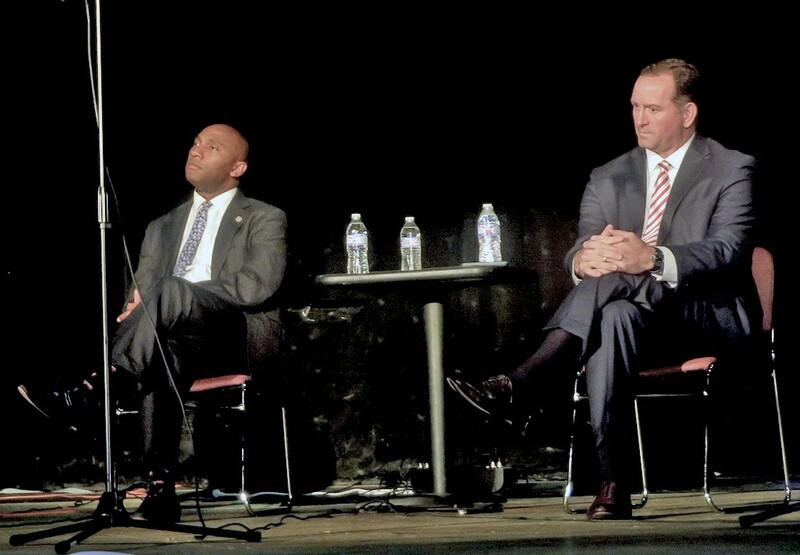 There are several factors that make the contest for Shelby County mayor hard to predict — not least the apparent parity demonstrated by the two candidates — Republican David Lenoir and Democrat Lee Harris — in the several public encounters they have had together. The first two major debates between the two probably added up to a draw. the-road business types; and 2) being willing to take on the role of aggressor, attacking Harris three times on what he perceived as one of Harris’s weak points, public safety, each time without any kind of response from the Democrat. In the second debate, co-sponsored by the NAACP and the ad hoc Voting is Power901 (VIP901) group and held at the National Civil Rights Museum, Harris probably took the honors on the strength of having a playing field more congenial to his left-center views and on a new readiness to defend his positions and to mix it up with Lenoir on the attack front. In a general sense, Lenoir carried into the general election race the kind of edge in financing that Republican nominees normally enjoy, while Harris has at his disposal the theoretical fact of a Democratic majority, based on the demographics of Shelby County. Inasmuch as the first of these advantages, the bounty of the GOP purse, is a consistent given in local elections, the election could hinge on the degree to which the county’s Democrats actually do manage to cohere and get their vote out — as, conspicuously, they have had trouble doing, except in presidential elections. As it happens, there does indeed seem to be a more defined and organized degree of focus among Shelby County Democrats this year, and more than a few Republicans worry about the prospect of misplaced complacency in local GOP ranks. 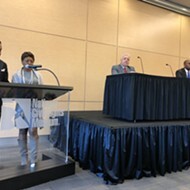 But the fact remains: The mayoral race, like other one-on-ones on the August 2nd ballot, is hard to call, and two additional debates between Harris and Lenoir, held this past week, did little to resolve the matter. Not that the candidates failed to measure up. Both performed well, and both, especially in the second of the two events — a forum focusing on neighborhood issues at Circuit Playhouse — indicated a familiarity with the issues and a developed sense of what to do about them. 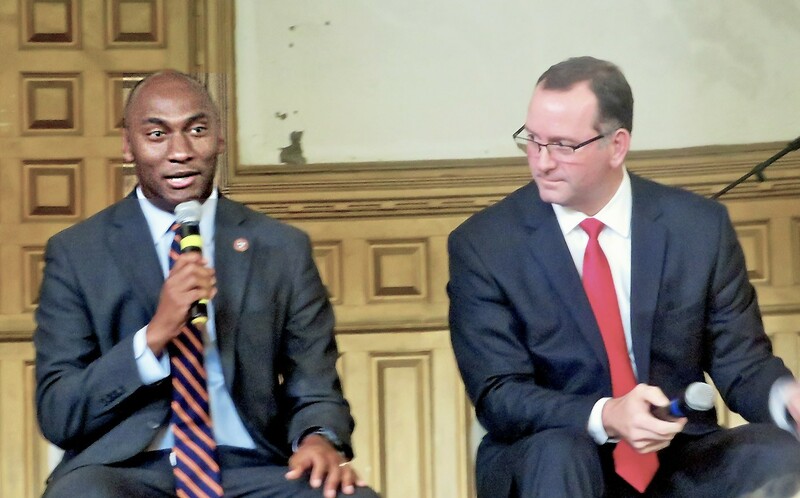 The initial encounter of the week — a Tuesday debate before a Rotary Club luncheon at Clayborn Temple — set the tone and reaffirmed the precepts of the two mayoral campaigns. The first question called for — and got — a self-definition from each of the candidates. 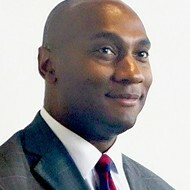 Lenoir, who has spent the last eight years as Shelby County trustee, a job requiring that he collect and manage the county’s fiscal assets, cast himself as “a problem-solver first and a public servant second.” Noting that he came to office in late 2010, in the middle of a still-raging recession, Lenoir claimed to have “made Shelby County stronger,” citing a reduction in the county’s debt, a rise in its savings, and a lower tax rate. For his part, state Senator Harris declared his ability to “bring people together” and “work with anyone” and claimed to have “passed more bills than any Democrat in the state” — most of these measures sponsored or co-sponsored by the General Assembly’s dominant Republicans — all the while keeping the Democratic faith by striving to extend the benefits of health care and quality education. Lenoir cautioned about “double taxation,” noting that MATA’s purview was, for the most part, restricted to the area of Memphis proper and that city government was essentially responsible for its funding and management. Moderator Otis Sanford put enough of a finger on the scales to point out that specific bus routes extended beyond the city limits. On the general question of how best to establish equality and social justice, the candidates also differed. Lenoir touted what he said had been his efforts as trustee to educate the public on fiscal issues, including an educational effort inside Juvenile Court to tap the entrepreneurial instincts of youthful offenders. 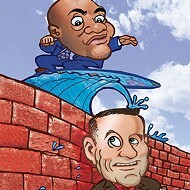 He proposed “wealth creation, not wealth transfer” or “a radical, new wave, new agenda campaign” as the key to progress. For his part, Harris said the problem required a “perspective that is social justice-oriented,” and recommended that, in replacing the current, outmoded facilities for juvenile detentions, provision be made for fewer, not more confinements. He supported the continuation of the federal oversight that was imposed on Juvenile Court in 2012, whereas Lenoir said he would defer to the opinions of current Mayor Mark Luttrell and Juvenile Court Judge Dan Michael, who have sought to have the oversight terminated. Both candidates paid homage to the principle of frugality, with Lenoir boasting the efforts of Shelby County government during his tenure to lower the county debt and Harris noting that he slept in his Senate office, “on the floor,” during overnights in Nashville. 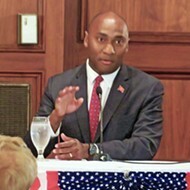 Lenoir cited two occasions from Harris’ governmental record to refute Harris’ claims, as City Councilman and state senator, never to have voted for a tax increase, to which Harris retorted, “At least I have a record,” contrasting his hands-on involvement in budgetary and taxation matters in health care and in other areas with what he said was Lenoir’s total lack of such experience. Harris stressed his active role in efforts that led up to the removal of Confederate statues from downtown parks, and Lenoir cited documentation to establish that rumors of his having opposed that process were ill-founded. Both candidates gave President Trump’s ongoing “zero tolerance” approach to immigration a wide berth. Harris, who has in fact moved quickly through governmental ranks, disputed the first matter and made credible explanations of his voting record, converting the two allegations into proofs of his detailed — and more nuanced — experience with the range of public issues. Two nights later, the argument was continued on the stage of Circuit Playhouse, where, for roughly an hour and a half, moderator Marc Fleischer and representatives of various neighborhood associations subjected the two contenders to what was probably their most detailed grilling yet on the issues. The proportion of ad hominem exchanges in the Thursday night encounter was considerably diminished, as Lenoir and Harris set out to demonstrate their familiarity with the several subject areas they were asked about and their ability to suggest hands-on solutions. The candidates were asked not just about MATA in the abstract, for example, but whether they had ridden the bus themselves, when they had, and what the routes were. Similarly, they were asked to detail what their associations with neighborhood associations had been. Lenoir got to drop the names of well-known activists like Janet Boscarini and Charlie Caswell that he had worked “shoulder-to-shoulder” with, removing blight or clearing property, and Harris alluded to his watchdog efforts, in tandem with Republican legislator Brian Kelsey, to put an end to TVA drilling at the Memphis aquifer that threatened to contaminate Memphis’ pristine drinking water. Mere days before the current weekend’s “Roundhouse Revival” activities at the Fairgrounds site of the long-dormant Coliseum, both candidates waxed nostalgic and put themselves on record as lamenting the terms of the contract of the Grizzlies that kept the facility from serving as an arena. 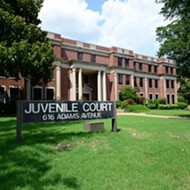 Both weighed in on subjects as diverse as EDGE, Land Banks, Victorian Village, a proposed Juvenile Assessment Center, agreeing here, disagreeing there, but creating a sense that each was aware of the myriad issues confronting the county and each had some detailed and precise and often original notion of how to deal with it all. All in all, the debate served as something of a symposium, as a classroom of sorts for the audience. There was something of a partisan divide, to be sure, both in the audience and between the two candidates themselves, but nothing like the unbridgeable chasms of our national politics at the moment. Each side might — and did — claim victory, but from an audience perspective, it was something of a win/win, generating a sense that, however this thing comes out on August 2nd, whoever wins will be adequately prepared and not closed off from the ideas of the opposition.